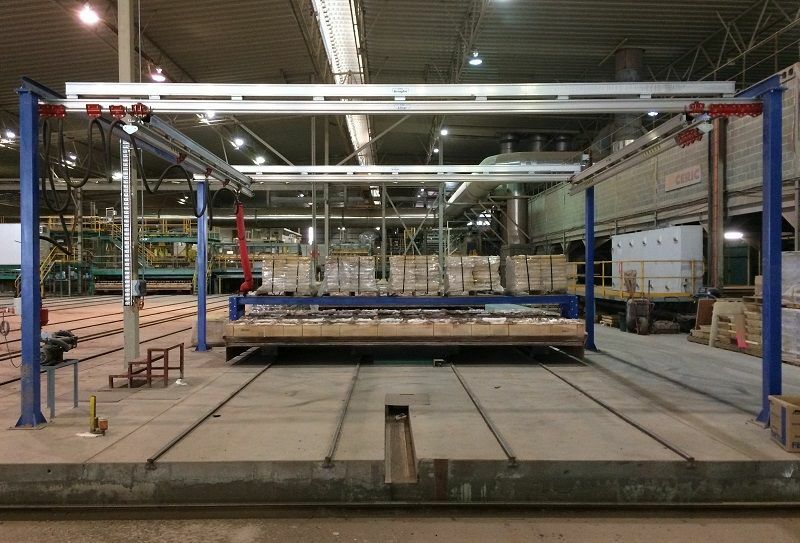 After firing large ceramic blocks, Brikmakers in WA moved them out of the kiln and onto the production floor using a large moving platform on tracks. The workspace was in the middle of the floor as it needed to be away from the kilns, so wall mounting was not an option. Once they were cooled they needed to be moved individually from the platform. As each paver weighed 30kg and was 500mm x 540mm, they were large and awkward to handle manually. Additionally, the pavers could not be gripped on the sides as they were tacked side by side. At the heart of the problem was the fact that Brikmaker’s was under pressure from overseas competition and needed to find ways to increase their efficiency to remain competitive. Bomac custom designed a freestanding Altrac gantry crane to be installed over the required workspace. It was fitted with a vacuum lifter that could lift and move each ceramic block individually without causing any damage. As Brikmaker’s facilities are located in WA, engineers were able to liaise and allow the customer to build and install their own steel footings. This meant that only the lightweight aluminium rails needed to be transported across the country, saving the customer on shipping costs. The Brikmaker team were then easily able to install the crane themselves. One of the great benefits of an Altrac system is that it can be installed without any special equipment or tools, with no onsite welding. The customer is absolutely delighted with this solution. Project manager Fernando Urrutia recently emailed to tell us the onsite managers are “very happy” with the crane and that it has “increased the productivity by 100%”. He is already working with Bomac engineers to expand the system for increased use going forward. Bomac engineers are pleased to see their own Australian made products supporting another Australian manufacturing company to stay competitive in their industry by improving productivity and maintaining safety standards.